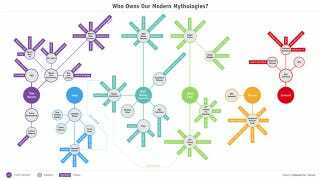 Chart: Who owns our modern myths and legends? Our modern era doesn't just celebrate stories about gods and demi-gods — we have a whole host of new mythic figures that we obsess about, from Luke Skywalker to Superman to Captain Kirk. But who owns these legends? Top image: Superman Vs. Spider-Man, by Alex Ross. As always, click to enlarge, or right-click and select "open link in new tab." A few caveats apply. We established the current ownership, or investment in, properties, to the best of our knowledge. In the case of movie rights, options do expire, and production deals may be only for a particular project. Twentieth Century Fox has been a co-production partner in the live-action Star Wars films, but may not own any rights to Star Wars beyond those films. Obviously, the truth of who owns what is always debatable and subject to reams of contractual language, which we don't have at our fingertips. So this is our best guess as to which corporations have a stake in our modern folklore. Additional reporting by Gordon Jackson and Katharine Trendacosta.